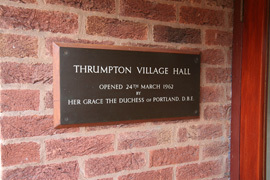 Thrumpton Village Hall was originally opened in March 1962. In the years since then the villagers have not only kept this their only community facility in good repair, but have also made some significant improvements and alterations to it. Autumn 2007 saw the opening of a new side extension, which allows a greater range of activities to take place. This project was facilitated by grants from WREN, Rushcliffe Borough Council, Nottinghamshire Electoral Division Initiative and Awards for All. In 2013 a further small extension, for storage, replaced the external shed. 2014 saw the toilet facilities upgraded with new fittings and flooring; grants from WREN and Nottinghamshire Electoral Division Initiative assisted with this. The Hall is a good size and can be hired for corporate and individual events. It has ramped wheelchair access, toilets, a well equipped kitchen, bar (on request) and sound system including induction loop. Car parking is available on the forecourt and the village street (Church Lane). 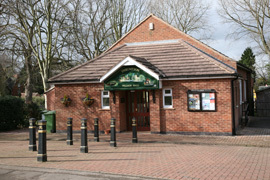 The Village Hall’s Management Committee holds regular meetings during the year between AGMs, usually held in October, and generally controls and supervises the activities of the Village Hall & Social Club. If you would like to read minutes of these meetings please contact the Secretary (see Contact Us page).